Ontario’s Government for the People is proposing a new Ontario Childcare Access and Relief from Expenses (CARE) tax credit. The CARE tax credit would be one of the most flexible child care initiatives ever introduced in Ontario. It is a plan to put parents, and not the government, at the centre of the child care decision-making process. The CARE tax credit would be on top of the existing Child Care Expense Deduction (CCED) and focus benefits on low- and moderate-income families. Families could receive up to $6,000 per child under seven, up to $3,750 per child between the ages of seven and 16, and up to $8,250 per child with a severe disability. This new CARE tax credit would provide about 300,000 families with up to 75 per cent of their eligible child care expenses and allow families to access a broad range of child care options, including care in centres, homes and camps. The CARE tax credit would support families with incomes of up to $150,000 and help them access a broader range of child care options. The CARE tax credit would be available in addition to the CCED, which provides provincial and federal tax relief toward eligible child care expenses. The CCED provides greater tax relief, on average, to higher-income families as a percentage of their expenses. In contrast, the CARE tax credit would provide a higher credit rate to families with lower incomes, filling the gap in support for these families. Lower-income families who would benefit include those joining the workforce or deciding to work more hours. Parents would need to keep the receipts for the child care expenses they incur. Starting with the 2021 tax year, the credit would also be available through regular advance payments during the year. The CARE tax credit builds on Ontario’s commitment to help low-income workers through the Low-income Individuals and Families Tax (LIFT) Credit, which provides low-income workers, including those making minimum wage, with up to $850 ($1,700 for couples) in tax relief. 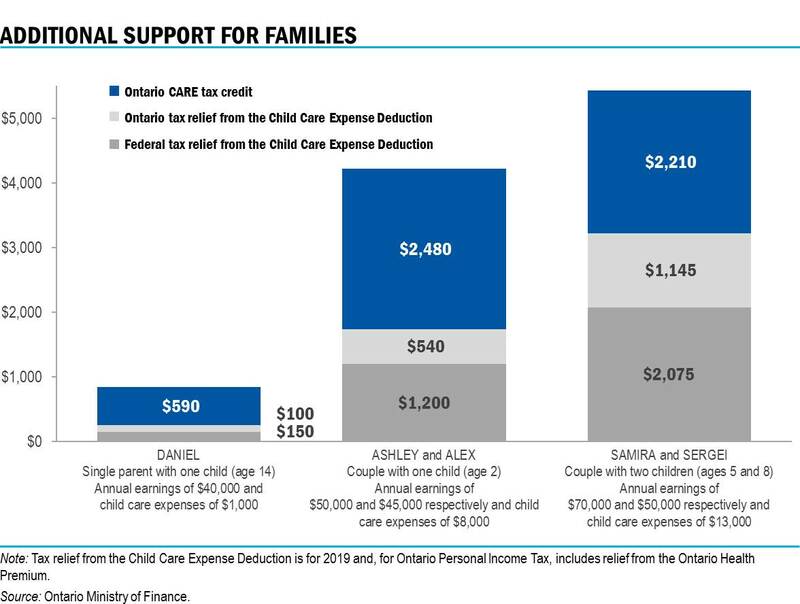 This bar chart shows three examples of the additional support families would get in 2019 from the proposed Ontario CARE tax credit on top of the federal and Ontario Personal Income Tax relief they receive from the existing Child Care Expense Deduction. Left section: A single parent (Daniel) with a fourteen-year-old child, annual earnings of $40,000, and eligible child care expenses of $1,000 for the year would get $150 in federal tax relief and $100 in Ontario tax relief from the deduction and an extra $590 from the proposed Ontario CARE tax credit. Middle section: A couple (Ashley and Alex) with a two-year-old child, annual earnings of $50,000 and $45,000 respectively, and eligible child care expenses of $8,000 would get $1,200 in federal tax relief and $540 in Ontario tax relief from the deduction and an extra $2,480 from the proposed Ontario CARE tax credit. Right section: A couple (Samira and Sergei) with two children (ages five and eight), annual earnings of $70,000 and $50,000 respectively, and eligible child care expenses of $13,000 would get $2,075 in federal tax relief and $1,145 in Ontario tax relief from the deduction and an extra $2,210 from the proposed Ontario CARE tax credit. Note: Tax relief from the Child Care Expense Deduction is for 2019 and, for Ontario Personal Income Tax, includes relief from the Ontario Health Premium. This chart shows the average support provided, as a percentage of eligible child care expenses, by federal and provincial Personal Income Tax relief through the Child Care Expense Deduction and the proposed Ontario CARE tax credit. The chart shows that the average federal and Ontario tax relief provided by the deduction (bottom grey areas) provide relatively little benefit for lower-income families, and increases with family income as a percentage of eligible child care expenses. 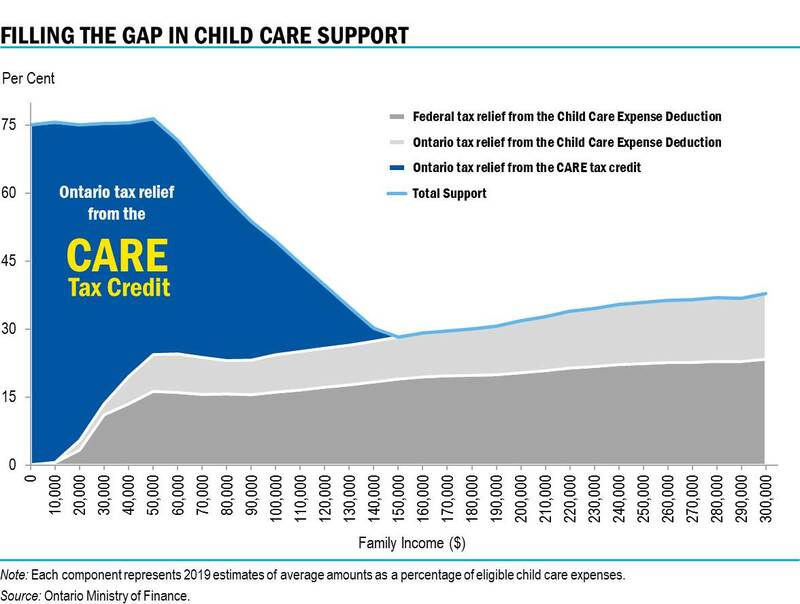 To fill this gap, the chart shows the additional support that the proposed Ontario CARE tax credit (upper dark blue area with yellow text spelling “CARE”) would provide, bringing the average overall relief up to about 75 per cent of eligible child care expenses for families with incomes of up to around $60,000. After this point, the overall support provided by the proposed tax credit and the deduction decreases until family income reaches $150,000, after which the tax credit would be reduced to zero and families could only benefit from the tax relief provided by the deduction. Note: Each component represents 2019 estimates of average amounts as a percentage of eligible child care expenses.